This reaction is the main source of heat for the smelting operation and also produces the reducing gas (CO) that ascends into the furnace stack where it preheats and reduces most of the iron oxide in the burden as it descend to the hearth. Any moisture present in the hot air blast also reacts with the carbon of the coke. This reaction consumes heat and produces more reducing gas which is a mixture of CO and H2. Hence where high blast temperatures are available (1000 deg C to 1200 deg C), it is advantageous to keep the moisture content of the hot air blast uniformly at a high level by the steam additions in order to increase the amount of reducing gases ascending the furnace stack. The advantage of above reaction is that there is the introduction of hydrogen gas in the furnace reducing gases which decreases of the density of the ascending gases. This results in an increase in the equivalent volume of reducing gas thus providing less resistance to burden descent. The ascending gases start to reduce the iron oxide of the burden in the upper portion of the blast furnace where the temperature is below 925 deg C. At this temperature, chemical equilibrium prevents all the CO and H2 fro being used for reduction (the equilibrium CO/CO2 ratio is around 2.3 for the reduction of FeO, if the ratio falls below 2.3 than iron is reoxidized). Hence the molecular ratio of CO or H2 to iron oxide must be around three times the amount shown in the following stoichiometric reactions. The part of iron oxide which is not reduced in the upper part of the furnace where the temperatures are relatively low, is to be reduced in the lower part of the furnace where the temperature is high. In this part, CO2 and H2O are not stable at this teperature in the presence of large quantity of coke and they react with carbon as rapidly as they are formed. In view of this, the reduction s in this part of the furnace the reduction takes place as per the following reactions. In both the cases whether reactant is CO or H2, the overall reduction reaction in this part of the furnace is represented by the following equation. The carbon monoxide is capable of reducing hematite (Fe2O3) to iron, with magnetite (Fe3O4) and w?stite (FexO) appearing as intermediate products at temperatures above 570 deg C. In each case, the reaction is reversible and equilibrium is established when the gas attains a composition that, at constant pressure, is dependent only on temperature. Such an equilibrium relationship is shown in Fig. 1, together with those for the low temperature reduction of magnetite to iron. In the blast furnace stack, reduction is complicated by the presence of coke that causes the CO concentration to be influenced by the Boudouard reaction which is named after Octave Leopold Boudouard. It is the redox reaction of a chemical equilibrium mixture of carbon monoxide and carbon dioxide at a given temperature. It is the disproportionation of carbon monoxide into carbon dioxide and graphite or its reverse. Due to Boudouard reaction, the changes are experienced by an element of gas as it enters the blast furnace stack at an initial temperature of about 1000 deg C and rises to the throat reducing and heating the burden on its way. From Fig. 1 in which the Boudouard line is superimposed on the oxide reduction equilibriums, it can be seen that a gas consisting of 100% CO is capable of reducing the oxide to metallic iron. If the temperature falls to 900 deg C, equilibrium with FexO is established at 70 % CO + 30 % CO2. The element of gas may then be supposed to come into contact with coke and, if the temperature falls again, this time to 800 deg C, CO would be regenerated and its concentration is raised to 90 %, so that it is again possible to reduce FexO to metallic iron. Oscillation between the gas compositions indicated by the two lines could continue until the temperature had fallen to 700 deg C, when the influence of the Boudouard reaction will be such that no reduction of FexO can take place, although at temperatures between 700 deg C and 650 deg C, reduction of Fe2O3 to FexO via Fe3O4, will still be possible. At temperatures below 650 deg C, Fe2O3 can be reduced to Fe3O4, but the reaction rate is expected to be slow. The gaseous reduction is sometimes known as `indirect reduction’, because the reducing agent, i.e. CO, is derived from the combustion of carbon. Gaseous reduction is nevertheless the term that is preferred here, since it encompasses reduction by hydrogen. Burden entering the bosh is pre-heated and partially reduced. The remaining oxygen is removed by reduction with solid carbon as per the following equation. Carbon reduction is highly endothermic and requires the combustion of coke to make good the heat it consumes. The use of carbon as a reductant is ‘direct reduction’, called carbon reduction. At the face of it, the endothermic nature of carbon reduction appears to be unattractive in comparison to gaseous reduction, which is exothermic. However in actual the situation is slightly more complex. 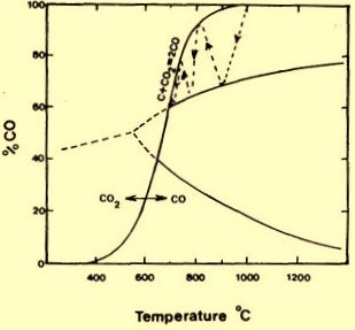 Firstly, the CO comes from coke, and the equilibrium limitations prevent complete combustion to CO. Secondly, gaseous reduction yields a large thermal surplus, and by way of contrast, though carbon reduction is associated with a thermal deficit, it uses only one third of the amount of carbon to produce each mole of iron. Here lies the attraction of a combination of the two reduction mechanisms, since some of the heat generated by gaseous reduction (or more accurately by the combustion of coke to CO) can be used to compensate for the heat requirements of fuel-saving carbon reduction. Both types of reactions are therefore encountered in the blast furnace, with some 60 % to 65 % of the oxygen originally present in the burden being removed by gaseous means and the remainder by carbon reduction. At the temperature in the upper part of the blast furnace stack, the higher oxides of manganese are reduced by CO as per the following reactions. However the lower oxides of manganese (MnO) are not reduced by CO or H2 at any of the temperatures that are experienced in the stack. The final reduction of manganese is due to the following reaction that takes place at temperatures above 1500 deg C.
This reaction absorbs large quantities of heat. At higher temperatures the percentage of manganese that can be reduced increases, but in most basic practices manganese reduction is around 65 % to 75 % of the amount of the manganese charged. The manganese that is reduced dissolves in the hot metal while the unreduced portion remains as the part of the slag. Due to it, manganese partitioning is an indicator of the thermal state of the hearth. There are two different reactions governing silicon transfer to the hot metal. Among the ways silicon monoxide gas can form is when coke burns in front of the tuyeres and silica in the ash is reduced and volatized. The silicon monoxide reacts with molten iron as per the following reaction and silicon content of the iron increases. The FeO is subsequently reduced by the ever present CO. The reduction of SiO2 also takes place at very high temperatures as per the following chemical reaction. The rate of this reaction is relatively slow but accelerates with an increase in the temperature. For a particular burden and slag composition the silicon content of the hot metal is proportional to the hot metal temperature. The percentage of silicon in the hot metal can be increas3d by increasing the silicon content of the charge and the coke rate. The sulphur that combines with the iron is removed at the very high temperatures that exist in the hearth. This is done by reduction of iron sulphide in the presence of a basic flux such as lime (CaO) as per the following equation. The amount of sulphur removed depends on the temperature of the hearth, the slag basicity (CaO+MgO/SiO2+Al2O3, and the slag volume. The reduction of phosphorus in the blast furnace takes place as per the following reaction. The final reduction of phosphorus also takes place only at very high temperatures. However, unlike manganese and silicon the phosphorus is essentially completely reduced. For this reason, virtually all of the phosphorus in the burden materials will dissolve in the hot metal. Gangue materials in the ores such as silica and alumina and ash in the coke are the basis of the slag that collects in the hearth of the furnace. The formation of fusible slag is facilitated by the inclusion of fluxes in the burden materials such as lime (CaO) and magnesia (MgO). These elements are used to produce a slag of the desired composition. The factors determining the optimum composition are physical, chemical and commercial and the final choice is usually that of a compromise between the three. Slag must be fluid to run freely from the blast furnace and also it should have the capacity to absorb sulphur. The silicon and manganese levels in the hot metal and the recirculation of alkalis are also influenced by slag composition. The major constituents of blast furnace slags are the four oxides CaO, MgO, SiO2 an Al2O3 and the sum of their concentrations usually exceeds 95 %. Other elements in the slag are MnO, S, K2O, FeO and Na2O etc. Melting temperatures vary between 1200 deg C to 1400 deg C. Chemical characteristics of the slag is determined by its composition and accordingly it can be either acidic or basic. Slags having higher CaO content are basic while slags with high SiO2 content are acidic. The slag basicity is a ratio which is defined either as CaO/SiO2 or as (CaO + MgO)/(SiO2 + Al2O3). The slag basicity influences the distribution of elements between slag and hot metal and hence affects the hot metal composition.